In the past week, a body was found at Shields Park, another body was found near downtown Spokane. Some one was shot in the Spokane Vally on Sunday morning – not even a peep in the news until Tuesday and still no names or descriptions or anything. Another shooting took place on Wednesday (not clear there were victims) and police shot and killed an unarmed mentally ill man on Thursday – the day after announcing a new gentler police department that has implemented new use of force guidelines to avoid killing innocent people like Otto Zehm, in the future. Thursday, a 17 year old has been arrested for attempted murder after stabbing someone in the head in the morning. 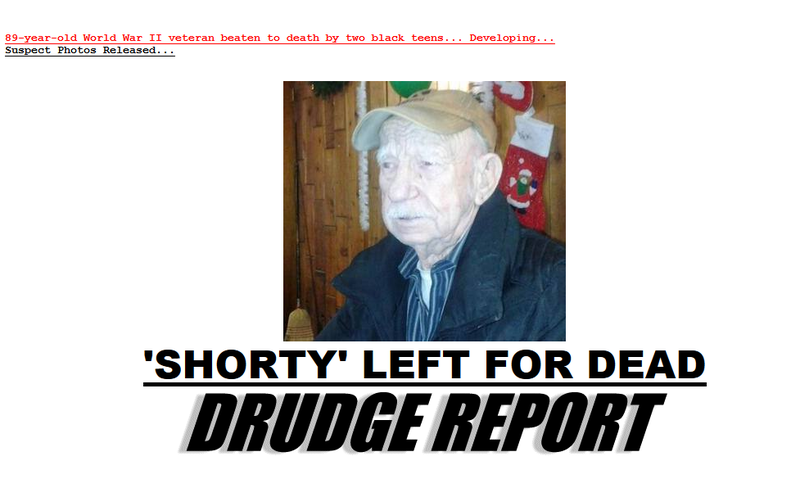 Wednesday night an 88 year old World War II veteran was beaten outside the Eagles Ice Arena, and died, resulting in Greater Spokane Inc’s greatest nightmare – a top of the page spread on DrudgeReport.com. You can’t buy publicity like this. 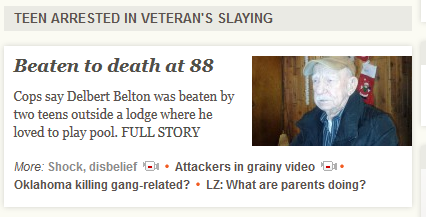 It’s also a top story on CBSNEWS.com. Friday morning, a man opened fire inside a pawn shop on E. Sprague Ave with claims of holding a hostage. On Sunday, in nearby CDA, police shot and killed a man. A few more assorted stabbings and assaults. Fun place! Oh, and yet another body found alongside a road early in the next week – and another self inflicted gun shot a day later. Spokane has gone to hell and local political and business leaders have only themselves to blame. These are self inflicted wounds made as a result of self serving policy decisions. Spokane is extremely sick. These acts of violence are not “normal”. What we will do about it? Tell lies, lots of lies. That always works. So which is it? Crime isn’t that bad – or it’s becoming more and more the trend and we need more police officers? The WSU Washington Center for Real Estate Research issues a quarterly report on real estate in areas in Washington. The following quotes on general economic conditions are from the summary for the Spokane Kootenai area for the Spring 2013 report. Conditions may have changed since the Spring report. Their general thoughts on the Spokane economy are glum, at best, unfortunately. Total employed is less than in 2006 – we should have 15,000 to 20,000 more jobs today. Per capita income is about where it was in 2007. Taxable retail sales trending around 2006 levels. The data makes a case for little change in migration to the county. There is certainly no increase of in-migration. Other data would indicate that out-migration has picked up. This sensitive indicator bears watching. The labor force is the same size as 2007. Total employment is 4 thousand less than the 2006 annual average. While there are kernels of positive results in the employment picture, the reality is that there should be 15 to 20 thousand more people working in this market. Through 2011, real per capita personal income was less than the 2007 total. Projections for 2012 and 2013 would indicate some improvement. Projections by Global Insight indicate that total Personal Income is now over $18 billion and may approach $20 billion by 2015. Transfer payments from the Federal Government are still a big factor for the County (23%). Nice turnaround in 2012 but still below 2006 total. Contracting sales are running at 75% of peak. The County needs at least $280 million in new construction activity. The chart breaks into sections, roughly as “before 1995”, “1995 to 2001”, and “2001 to 2013”. A line is drawn through each section to graphically illustrate the rate of job growth. The lines might also have been drawn from 2001 to 2007 and then 2007 to 2013, however that would result in a steep downward trend in the last section. The rate of growth in new jobs being added to the Spokane County economy has slowed markedly since the turn of the century. Chart is from the US BLS web site. The lack of job growth should be a high priority focus of local political and business leaders (Possibly related news item and comment). Sadly, there appears to be little to no serious priority given to this crisis. Total employed – note that past numbers have been adjusted since previous releases. Charts and data tables are from the Washington Employment Security Department. For the month of July (and July only) 54% of jobs lost during the downturn have been recovered. Essentially all the job losses were due to seasonal layoffs of annually contracted education sector workers. A school worker told me she is eligible for unemployment during the summer and then is rehired in the fall. All of the “government” (education) jobs will come back September-October as shown by this history chart. The annual large cycle in employment is due to the government sector. Was hoping to see growth show up in June as this now includes the Allegiance once per week Hawaii flights (to be discontinued shortly) and the daily subsidized flight to Los Angeles that started in June. Perhaps growth may resume in the summer. Felts Field may have bottomed. We hope. (The chart title has a typo – that should say “thru Jun 2013” not Jan 2013). 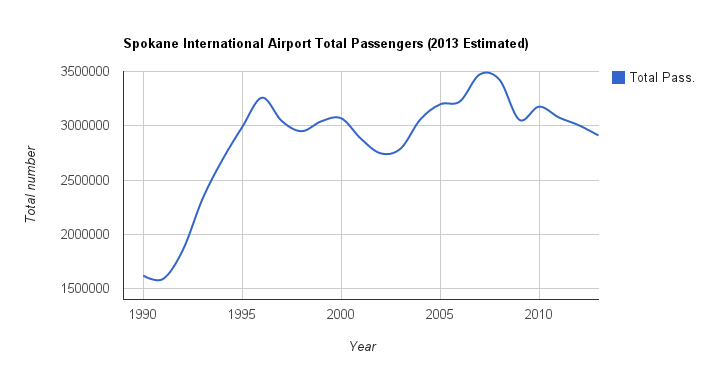 Local air traffic has long been used as a local economic indicator. During periods of growth, local officials routinely said air traffic growth was an indicator of the strength of the local economy. A decline in local air traffic (including passenger usage) indicates the Spokane County economy remains weak.